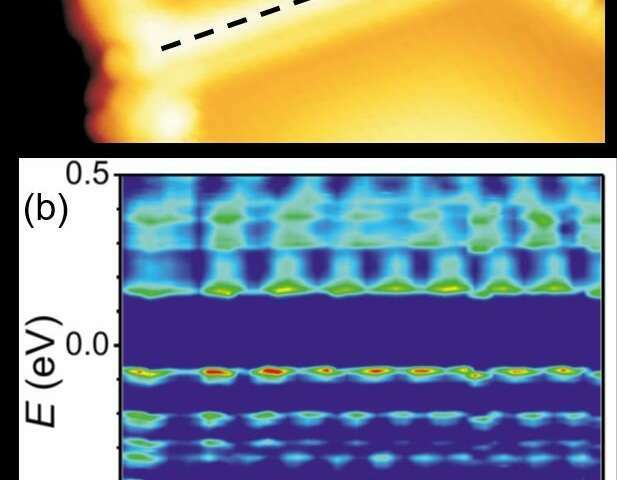 An international research team led by Professor Dr. Thomas Michely at the University of Cologne's Institute of Physics II has now produced one-dimensional wires, allowing them to witness the behaviour of trapped electrons in 1-D with the scanning tunneling microscope. They report on their discovery in the journal Physical Review X. "In 1950, Japanese physicist and later Nobel laureate Shin'ichiro Tomonaga imagined what electrons would do in a metal reduced to one dimension, that is, a chain of single atoms," said Michely. "The remarkable consequences that ensue when electrons can no longer avoid each other are particularly fascinating for us physicists. In a real 3-D crystal, their interaction is rather weak because they are quite free to move around in such an 'open' system. In 1-D, however, the electrons simply cannot avoid each other and begin to interact strongly." Electrons normally carry a charge and a spin, a quantum mechanical angular momentum. However, in 1-D, they stop behaving like normal electrons due to their strong interaction. Instead, they divide into two types of quasi-particles that have either spin or charge. Here electrons are better described as two independent waves: a spin density wave and a charge density wave. This phenomenon is called spin-charge separation and is the crux of the Tomonaga-Luttinger liquid theory, named after Tomonaga, who first formulated it in 1950, and the American theoretical physicist Joaquin Mazdak Luttinger, who developed the theory further. To be able to see this spin-charge separation locally for the first time, the researchers from Cologne trapped the so-called Tomonaga-Luttinger liquid in wire of finite length, essentially locking it in a cage. Due to the wire's finite length, standing electron waves with discrete energies form, as required by quantum mechanics. This makes it possible to explore the limits of Luttinger and Tomonaga's theories with a precision unfathomable during their time. 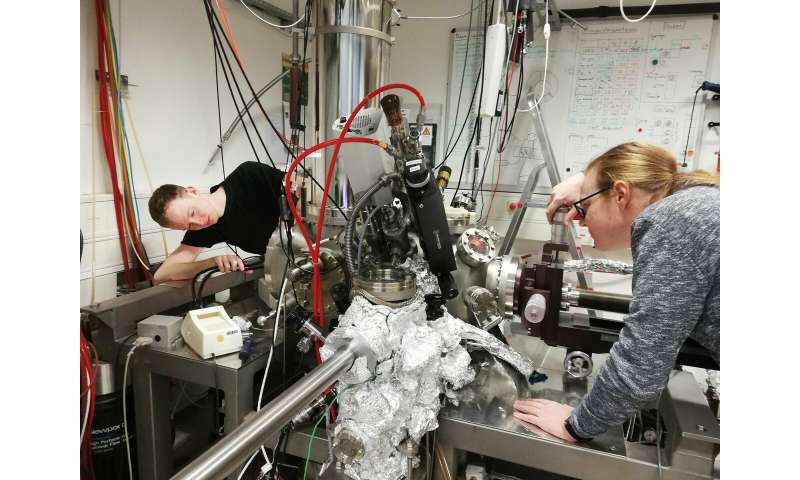 The research group at the Institute of Physics II specializes in the production and exploration of 2-D materials such as graphene and monolayer molybdenum disulfide (MoS2). They found that at the interface of two MoS2 islands, one of which is the mirror image of the other, a metallic wire of atoms forms. The researchers were able to visualize the standing waves along the wire and their discrete energies with the help of their scanning tunneling microscope at a temperature of -268 degrees C (5 Kelvin). To their surprise, the scientists discovered two sets of standing waves in the wire, while for 'normal' independent electrons, only one set would have been expected. The key to explaining the phenomenon came from the theoretical physicists around Professor Dr. Achim Rosch, also University of Cologne: The two sets of standing waves represent the spin density and the charge density waves, as Tomonaga and Luttinger predicted a half-century ago. The scientists are now planning to investigate the behaviour of the electrons in one-dimensional cages even more closely. To test the limits of the Tomonaga-Luttinger liquid theory, they want to conduct new experiments at temperatures more than 10 times lower (0.3 degrees Kelvin) and in an improved "cage."